Container gardeners (and fruit lovers) rejoice! You don't need a big yard to grow delicious apples, plums, or pears. With the right fruit, the right pot, the right compost and the right care, you can create your own little fruit orchard right on your balcony or terrace. There isn't really any "wrong" fruit to grow in pots. Apples, pears, plums, and cherries grow well, as do tender fruits like apricots, citrus, nectarines, and peaches. Figs can also be grown in pots providing their roots are kept in check. And most soft fruits like strawberries, blueberries, gooseberries, currants, and grapes work well, too. In most cases dwarf rootstock or compact varieties are available, but they are not necessary. Usually the restrictive nature of the pot will suffice in limiting the size of growth. The Notable Exceptions: Blackberries and certain hybrid berries are difficult to grow in pots because they can't seem to "contain" themselves due to vigorous growth. Autumn fruiting raspberries are fine, but plan on replacing them each year. To avoid a disappointing fruit crop, check the pollination needs of the type of fruit your growing. If it isn't self-pollinating (e.g. apples and pears), you may need to grow more than one plant in order to see fruit. The best containers for growing fruit are those only slightly larger (2-3 inches) than the existing rootball. A good size for most fruits is 18 inches in diameter and at least 16-18 inches deep. Soft fruits like strawberries can be grown in much smaller pots and work well in hanging baskets or window boxes. Set large pots on casters to make moving them around the yard and in and out of the house easier. Most fruit prefer a nutrient-rich growing medium. Blueberries prefer soil with a low pH (4-5.5). Add builders sand or vermiculite to ensure adequate drainage. The top 2 inches of potting soil should be removed each spring and replaced with fresh compost. If necessary, repot plants every 2 years (in winter) by potting up one size. Feeding: Like all container plants, fruit grown in pots need to be fed and watered more often than plants grown in the ground. Start feeding plants a high potassium fertilizer (like pot ash) as fruit starts to develop. Switch to a fertilizer high in nitrogen in late summer. For citrus fruits, feed them a high-nitrogen fertilizer starting in the spring and through to midsummer. Then switch to a balanced fertilizer until fall. Remember, how often and how much fertilizer will depend partly on the type of fruit your growing. Too much fertilizer can be counter-productive (even lethal) so err on the side of caution. Watering: Keep compost moist, but not wet during the active growing season. This may require watering plants multiple times daily to prevent the growing medium from drying out. Sunshine: In general, fruit grown in pots should be placed outside in the summer in a warm, sheltered location with plenty of sun. Depending on the fruit, plants will need to be brought indoors and protected from cold in the winter. Rotate pots on a weekly basis if they are placed near a wall or fence. 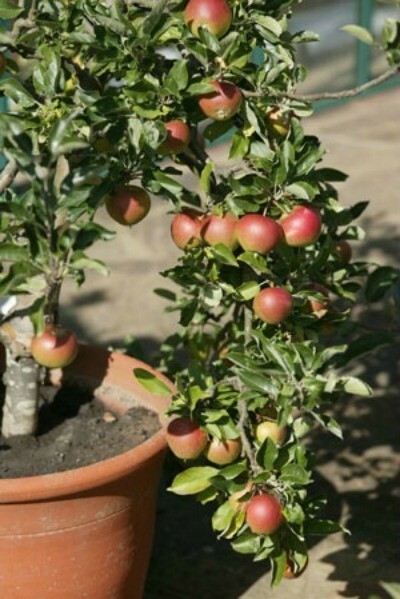 Thin the fruit or give the tree extra support to avoid damaging branches from the weight of growing fruit. Never allow the growing medium to dry out. Ever! Don't allow roots to stand in water. Make sure pots allow for proper drainage. Bring frost sensitive fruit trees indoors for the winter. About The Author: Ellen Brown is an environmental writer and photographer and the owner of Sustainable Media, an environmental media company that specializes in helping businesses and organizations promote eco-friendly products and services.